Eyes have been glued to the t.v. to watch the Olympics this month, and Gabby Douglas has won America’s heart as she leapt into history as the first American athlete to win the prestigious team gold and the all-around gold medal in the same Olympics. The New York Times reports that Gabby wants to be a role model for minorities (possibly for her sponsor Kelloggs as an outreach in minor communities and possibly for her to take part in Michelle Obama’s “Let’s Move” campaign to promote exercise). 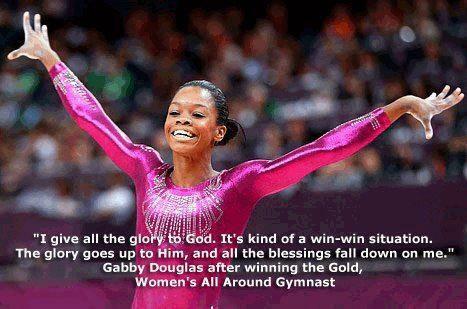 But Gabby is already being a role model to young people as a CHRISTIAN. She is giving God all the glory for her achievements! This is so exciting to me! Praise God He is using this tiny teenage girl and her talent in this incredible way! I am praying for God’s protection over her from becoming a target of hate and criticism, after seeing the backlash against Christian football quarterback Tim Tebow for his open declaration of faith in Jesus. God wants to use you and the gifts and talents inside of you for His glory, too! Click here to learn more about my upcoming 5-week, virtual G.I.F.T.S. Process. Gabby, you are an inspiration to me and so many others! Our prayers are with you!